The trade show industry is in a constant state of change, and trends are always on the move. One area in which there have been some major changes in recent years has been in the field of eco-friendliness. As the world in general becomes more aware of the importance of reducing carbon footprints, companies and organizations everywhere have turned their focus towards finding new and eco-friendly options. You may not be surprised to learn that the exhibition industry is leading the way, developing more environmentally friendly and sustainable solutions for exhibitors and convention halls. One of the ways in which the industry has been doing this is by designing more eco-friendly booth options and harnessing the potential of modern LED lighting systems for trade show marketers. Not only can switching to LED lights save electricity and reduce carbon footprints, but it can also help to create stunning exhibit graphic mural lighting effects. From wowing visitors with timed illuminating structures to amazing attendees with different tones, wash lights and spotlights, it’s never been easier to create a truly captivating booth environment in an eco-friendly way. For any startup, attracting attention to your company and brand couldn’t be more important when exhibiting at a trade show or conference. Making the right impression on customers and potential investors is crucial to the success of your business, and therefore finding ways of making your business stand out from the competition is paramount! Industry conferences are highly competitive environments, so you must make sure your trade show booth is eye-catching, visually appealing and engaging. What better way than by integrating LED lighting? Not only will you be showcasing your products and services in a high-tech and aesthetically pleasing way, you’ll also be showing your company’s commitment to protecting the environment. A backlit trade show counter not only makes your brand more visible in the conference center, it also gives a more professional appearance to your company. An LED light box display is the perfect backdrop solution for any inline booth size, and with the incorporation of cutting edge SEG fabric graphic technology, it’s possible to create a new and fresh design theme for each show. The ability to easily swap-out your backlit graphics between shows, will keep your display fresh and interesting to your target market. Ultimately, LED illuminated logo designs will make your brand stand out from the crowded competition. Since backlit displays come in a range of styles and designs, you can find a “quick-ship” portable backlit inline display or a customized modular LED light box booth structure that meets your needs for any promotional event. From SEG fabric pop up displays that can be assembled and dismantled within 30 minutes by just one person, to larger custom-sized modular backlit frames that are perfect for heavy duty re-usage for years, there are plenty of new generation trade show displays featuring LED light integration, that are perfect for showcasing startup brands. These solutions have proven to enhance brand building campaigns, while at the same time demonstrate a company’s environmentally sound status. One of the biggest problems associated with using traditional trade show stand lights is that they can produce a lot of glare (front attaching spotlights create glare on most display graphic material substrates). This, in turn, can result in your products not being displayed to their best advantage. Front attaching LED booth lights offer significantly less glare than traditional lights, which will allow you to showcase your products in an optically efficient “clear” manner. Every business that participates in trade shows strive to keep profits high and expenses low. This is especially true for most startups. One of the greatest advantages of LED light technology is longevity. LED lighting systems last much longer than traditional lights, which dramatically reduces the number of times you’ll need to replace or purchase new backlit display and signage hardware components. LED bulbs are long-lasting when compared to incandescent and fluorescent light bulbs. The average shelf life of commercial LED lights is 10 years. As an added advantage, you’ll save money in other ways too. 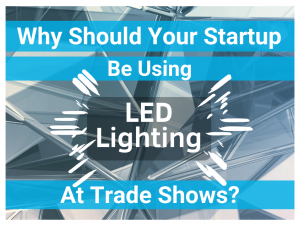 LED lighting systems tend to be less expensive to power than traditional booth lighting, reducing the amount electricity exhibitors will need to purchase from the show decorator. Most trade show event decorators, such as global provider Freeman, grossly markup booth electrical connection costs. Being able to consistently save money on your booth lighting services will quickly add up after just a few exhibitions. Of course, this is also extremely beneficial for the environment – a major positive point in favor of switching to LED lighting. Convention centers and conference halls can be very warm, and long days spent at your trade stand can be very uncomfortable when you’re hot and sweating. The good news is that you’ll find you’re exposed to less heat in your trade show or conference booth when you use LED light technology. Backlit graphics powered by LED “edge-lit” light strips give off far less heat than traditional fluorescent light bars, so you’ll be cooler and more comfortable while promoting your brand inside a booth space. LED lighting is advancing at a rapid rate. This means that if you choose to incorporate LED lighting as part of the integral components of your trade stand in the form of a backlit display or modular LED light box, you’ll be creating the impression of your company as a forward-thinking, modern business with an eye on future developments. This goes a long way towards boosting the reputation of your startup in the eyes of those within the industry and will help to move you ahead of your competition. Every business owner knows the importance of making their brand as visually appealing as possible. 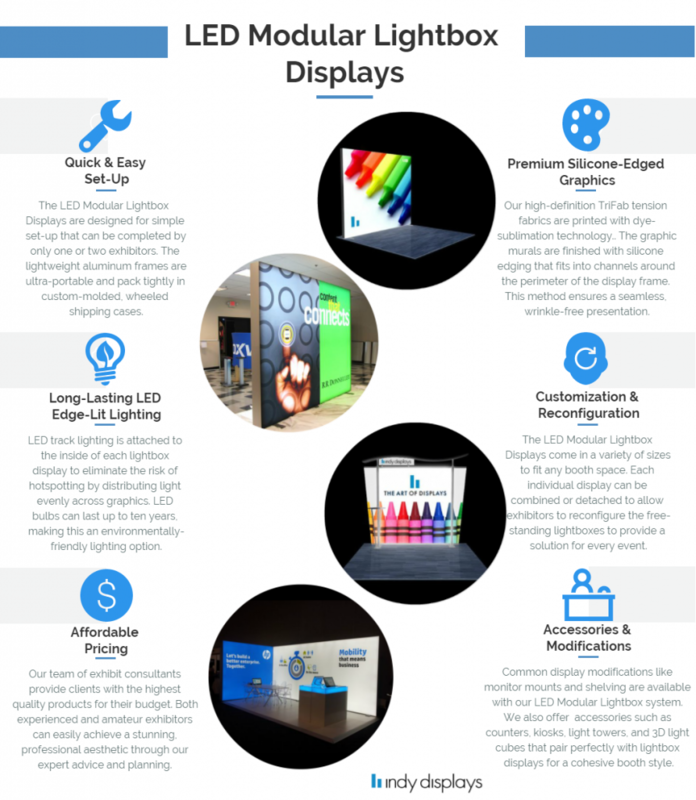 Finding creative ways to showcase products is paramount, and that’s where LED display enhancements can really come into their own. From backlit stage signage and wireless LED light towers to illuminated SEG fabric graphics with LED “edge-lit” light strips, the options are now endless for startups and small businesses wanting to utilize the power of LED brand illumination to help make a fabulous first impression. There are numerous benefits to switching to LED lighting for your next trade show, conference or retail promotion. Not only can you promote your business using today’s cutting-edge technology such as LEDs, touch screen monitors, drones and more, you have the opportunity to make your booth design stand out from the competition at an affordable price. Even better, you’ll be showing your startup’s commitment to innovation and customer experience. 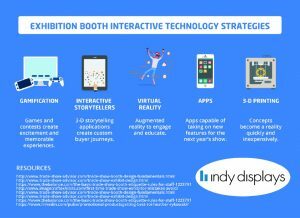 Utilize these technology trends to attract booth traffic with a fun and interactive experience. Trade show attendees are far more likely to remember your company if your brand features LED backlighting, fun promotional giveaways and organic interactions with your marketing team. There are many reasons to attend a trade show in your industry. Not only does it get your brand name “out there” and in front of potential clients, but you’ll also learn from the other vendors. There is a sort of camaraderie at trade shows that you won’t find elsewhere. While your competition might also have a presence, it doesn’t mean you won’t also make valuable connections and learn how to present your business even better. If you’re just getting your trade show marketing rolling and trying to convince your boss or client of the value of trade shows, point out that while it costs only $142 for a face-to-face meeting with a prospective client, it costs $259 for a meeting in that lead’s office. Not only do you have the opportunity to meet new potential clients at trade shows, but the cost of gaining a new client is also lower. 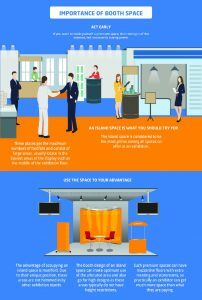 Once you’ve decided to leap into the trade show arena, you’ll want to ensure your booth is the absolute best it can be. 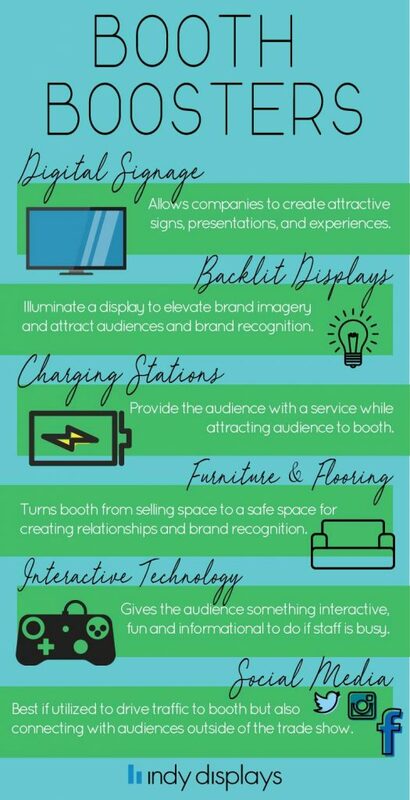 There are eight distinct things you can do to brand your business at a trade show and beyond. The number of booths at a trade show varies. Some of the largest events may have hundreds of exhibitors, but some of the smaller ones may have under 50. No matter how many other booths there are, you have to grab attendees’ attention if you want them to stop by your booth. Bright colors, an excellent location and beautiful signage are all keys to success. What can you do? Start by thinking about how your signs look from a distance as well as up close. You should reach people from a variety of positions. Studies show that about 85 percent of the success of an exhibitor directly ties back to the way the staff performs. Take the time to train anyone staffing your booth thoroughly. They should be as passionate about your business as you are and able to answer any questions prospective clients have. 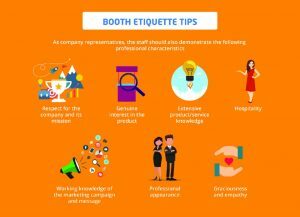 The way you approach attendees may vary depending on the personality of your brand, but everyone on the staff should have a similar approach to customers stopping by the booth. Conduct many training sessions before the event arrives. While it isn’t good just to have a memorized spiel — it’s potentially off-putting to people if it sounds rehearsed — it is good to have staff learn the full facts about your products, your services and your company. Ideally, booth staff should also wear the same uniforms so they are easy to identify. A uniform might be as simple as a company shirt and black slacks. One key to gaining traction from a trade show is finding ways to make your brand memorable. It’s good to stay in the consumer’s mind, but you don’t want it to be because you’re overly pushy. Hand out promotional items. About 85 percent of those who receive a free promotional item view the brand in a positive light. If you give them a product they’ll use frequently, they’re likely to think of your brand each time they use the product. If you want to pull attendees into your booth, find a way to make it fun and interactive. They are also more likely to remember your brand if they had a great time visiting your booth. Make sure what you put in place matches your brand. For example, if you sell golf clubs, setting up a putting green and letting people try out your putters is an excellent idea. If you sell website services to businesses, the putting green doesn’t make sense for your booth. Find something that puts your product or service in the hands of event attendees and shows them why you’re the best in your industry. We live in a mobile technology world. About 95 percent of Americans own a cell phone and 77 percent own smartphones. As people pass by your booth, they are likely to have a mobile device in their hands or pockets. You can use this to your advantage and reach them on a technological level. Use signage to tell them about an app they can download. Create a hashtag for your event and encourage photo ops in your booth. When you think of unique ways to integrate with their smartphones, you’ll reach them “in person” now, reach their online social media followers and feeds later, and generally remind them who you are and what you do. A contest allows you to give one of your cool products away to a potential customer. It also gives you an opportunity to collect contact information from people who are interested in what you have to offer. The smartest tactic is to offer one of your products or a service package as the contest prize. If you just offer something generic like a vacation, and you aren’t a vacation planner, then you’ll get entries from everyone. Instead, you want entries from your target demographic. Make sure the prize is something people in your chosen audience would want. Don’t be afraid of the competition at a trade show. See the event as an opportunity to scope out what your competition is doing well and what they might be missing. There may be gaps you can fill that your competition hasn’t thought of. You also have an opportunity to set yourself apart with anyone who stops by your booth. Around 91 percent of event attendees state that trade shows influence their buying decisions by letting them comparison shop between similar companies. Once the event is over, demonstrate your excellent customer outreach skills by contacting the leads you’ve connected with. A simple email, a postcard or even a phone call goes a long way toward securing your brand in the mind of the consumer and showing that you care about gaining their business. A little extra effort here results in additional customers you otherwise might not reach. Trade shows are worth the time and cost if you approach them strategically. Train your staff, create an eye-catching booth and understand that the goal isn’t always to land a customer at that moment. Instead, the result you’re aiming for is to make connections that lead to lifelong customers down the line. 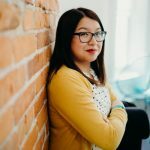 Lexie Lu is a web designer and UX strategist. Her work is featured on Marketo, Manta, Creative Bloq and Design Roast. Follow her on Twitter @lexieludesigner. With marijuana becoming legal in more and more places, it has become a very big business. Cannabis business conferences have sprung up all around the world to help people improve their sales, find new products and have a great time networking with others in the industry. But with so many new conferences, how do you know which ones are worth attending and which would just be a waste of your money, time and energy? Almost all conferences offer something of value if you’re on the lookout for the opportunities, but you can improve your chances of getting a lot out of the experience by checking out the ten best marijuana industry conferences for entrepreneurs. The Marijuana Business Conference Expo, better known as MJBizCon, is the most established conference of its kind. It is also one of the largest marijuana business conferences, so it is sure to have something you’re looking for. It happens several times throughout the year in different fun locations including Las Vegas and New Orleans. If you want to make sure to attend a cannabis business conference that other people have heard of and hold in high regard, then this is definitely one to keep on your radar. The National Cannabis Industry Association is the only trade association for the marijuana business, so it makes sense to follow what they are doing. One of the things they do is host this business expo. Over the past five years, this award-winning expo has proven that it will always cover a diverse range of topics to help both newbies and those who are well-established in the marijuana sales industry. You can get a broad overview of the industry or focus on speakers that appeal to exactly your current needs for information. The NCIA is the national trade association, but there is also a state association, the California Cannabis Industry Association, serving the needs of the United States’ largest adult-use market. California made medical marijuana legal in the 20th century, so there is an entire history of knowledge in this state about the best practices of marijuana business sales. Learn from the best. With so many cannabis business conferences happening all of the time, great ones will work hard to stand out with something different to offer. The New West Summit emphasizes the tech aspect of the marijuana business. If you want to attend a hackathon, learn about drones as a cannabis delivery service option or get help as a start-up, this Oakland, California conference should be on your calendar. Are you more interested in the science than the tech behind marijuana businesses? People who get excited to learn more about terpenoids, gene-assisted breeding and the relationship of marijuana to brain chemistry will definitely want to attend this innovative Portland conference. CSC was founded in 2016 by Joshua Crossney, the entrepreneur of medicinal marijuana in the United States. 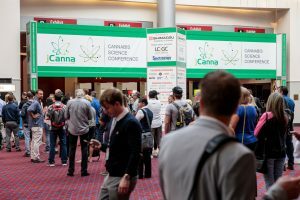 With over 3,000 show attendees and 150 booths of sponsors and exhibitors, this convention is considered the largest cannabis science exhibition in the world. Businesses and entrepreneurs involved in the growing side of the industry will particularly benefit from this conference. CSC offers a popular pre-show workshop called Canna Boot Camp. This all-day interactive workshop covers everything from marijuana cultivation, pre-processing, prep, analytical testing, THC extraction and manufacturing edibles. Industry professionals demonstrate technologies and techniques to share their personal experiences. This in-depth workshop gives entrepreneurs an understanding of the cannabis industry and the opportunity to network with cultivation experts. Many of the United States’ cannabis business conferences happen on the West Coast, but that doesn’t mean that East Coast sellers are left out in the cold. NECANN specializes in conferences held in Maine, Massachusetts, Rhode Island and other east coast states. The conferences in Maine and Rhode Island are especially popular, having been established over the past several years. People on the west coast or coming in from Canada may find new markets by attending this event. This is the perfect place for people interested in learning business techniques and tips. 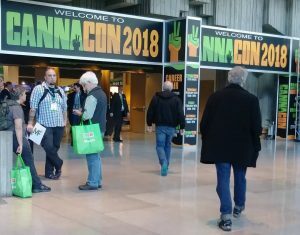 Although all marijuana business conferences offer that information to some degree, CannaCon specializes in the business end of the business. There are conferences in Seattle, Detroit and Boston, so you can pick the one that’s closest to you or go further away to learn something new. This unique two-day conference has one day set aside just for B2B customers and a second for the general public. The B2B side of things really brings to light the important business aspects of the marijuana industry, and it is an especially great starting point for newcomer entrepreneurs that attend this conference. Exhibitors may like to attend the general public event to share their products and meet industry buyers. This expo has been hosted in San Francisco, Denver and Portland. 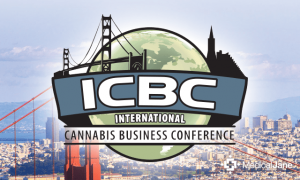 If you want to go to a great destination around the world – be that San Francisco or Berlin – to catch up on the latest in the marijuana business, then this is the perfect conference for you. This one specializes in bringing in well-known industry guest speakers such as cultural icon Henry Rollins. Who doesn’t want to enjoy a getaway to Jamaica? It’s even better when the trip is focused on the business of marijuana and you can write it off as a business expense on your taxes! This fun conference shouldn’t be overlooked, because it also offers a ton of great information in addition to the terrific Montego Bay location. CanEx is the premier Cannabis B2B conference in the Caribbean. Track sessions include information on finances, advocacy and women in the cannabis industry. There is no wrong cannabis business conference to attend on this list. As an entrepreneur, consider what you need to get out of the face-to-face event and whether you’ll be able to visit your preferred trade show exhibitors. If you want to get specific information about science or tech or women in the industry, look for the events that specialize in those areas, but don’t discount larger exhibitions that likely also have speakers on those topics. If you want to share your products with a new market, consider going outside of your regional area and attending one of the big conferences on another coast. 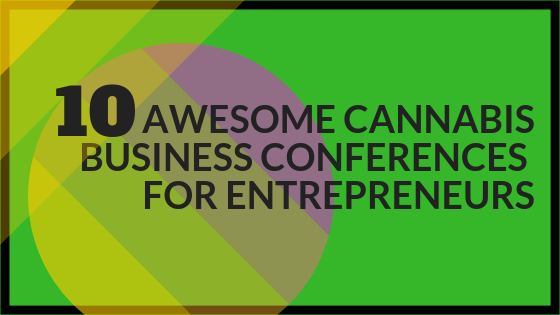 Once you’ve booked your trip to any of these 10 awesome cannabis business conferences, prepare to have a great time. Go in with an open mind, excited about the opportunity to learn from your peers. This is a welcoming industry and one with huge opportunity for growth. 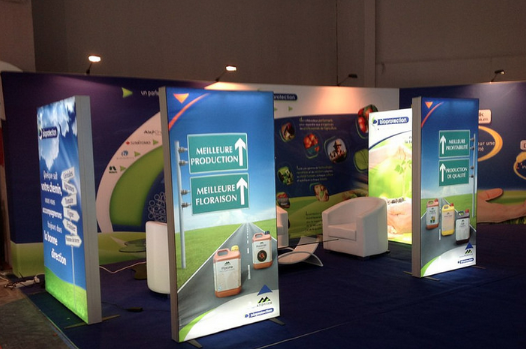 Portable SEG fabric display booth systems have recently been popular amongst competing expo industry manufacturers. Once a manufacturer launches a newly-engineered product line, other suppliers within the industry are beginning to replicate the design and functionality within a few months. This situation is making it difficult for many exhibitors to purchase a truly unique display booth. Unless an exhibiting company incorporates full custom fabrication into a new booth design project, small to medium size exhibitors will find it difficult to create a perfect eye-catching trade show display that’s within budget.. 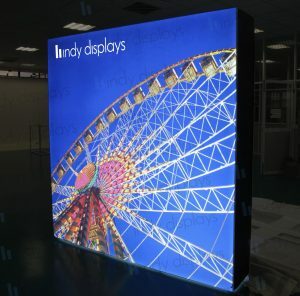 However, recent advancements in LED lighting and SEG fabric technologies are being incorporated into standard display systems, making portable backlit trade show displays now the most sought-after booth enhancement option available in the exhibition industry. Backlit Displays are the ideal modern exhibitor branding solution for standard inline booth spaces and larger island exhibit booths. Exhibitors can combine multiple double-sided LED modular light box SEG fabric booth walls (example shown above). In addition, display booth designers are integrating LED backlit structures into various layout configurations that include flat backlit circular hanging disc signs, large 12′ to 16′ tall square and circular LED graphic light towers, free-standing portable LED backlit graphic counters and new LED illuminated – elevated event flooring. 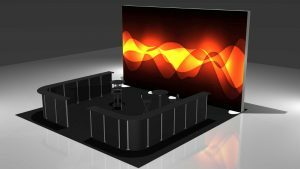 Furthermore, apart from its ability to enhance marketing booths, Backlit Trade Show Displays are becoming increasingly popular in the commercial sign industry. In retail markets, Outdoor LED signage and interactive LED digital signage are becoming common branding options in commercialreal estate, retail market and hugebranding facilities like museums, airports and big outdoor venues. 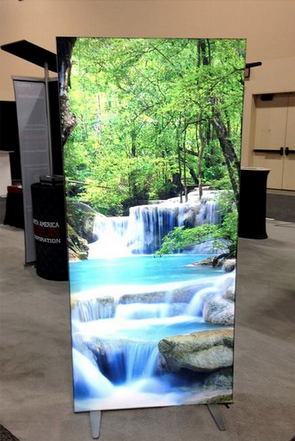 Portable backlit displays have recently been the rave of the moment in trade show booth designs. 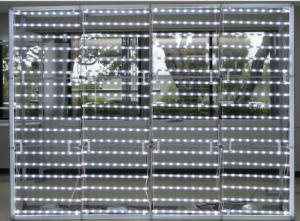 Thisis markedby a sharp drop in the price of the modern LED technology, where LED trade show backlighting has witnessedwidespread attention in the past two years. Illuminateddye sublimation graphics printed on premium opaque fabric materials like our premium “TriFab”, which significantly enhances the image and colorquality through modern ‘High Definition’ large format printing or HD dye sublimation quality printing. Also, a plummet in the wholesale price has been the primary reason behind the recent emergence of backlit trade show displays. 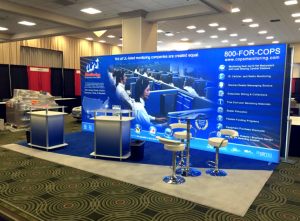 Want to grab the audience’s attention when they walk by your booth space? Placing a 4’w x 8’h Modular edge-lit LED light box stand in the front of your promotional floor space will do the trick! 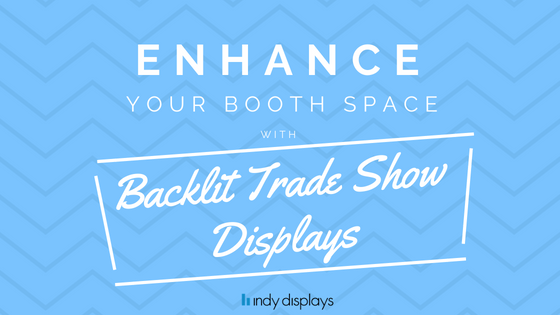 Use these displays in an inline booth space or in the front corners of an island booth space. The modular LED light box displays are available in six different standard frame sizes with a single sided graphic or double sided graphics. If one of these four standard sizes doesn’t work for your booth, let us build a completely custom size. Floating seamless SEG fabric graphic monitor mounts, quick attaching brochure holders and floating light box display product shelving that instantly attaches to the modular frame using magnet connection, are just a few standard backlit display stand accessory enhancements that Indy Displays keeps stocked and ready for expedited delivery! Indy Displays top-selling portable backlit exhibit wall is the brand-name Pliko modular LED “edge-lit” fabric light box display. This tool-less assembling modular 10’ x 10’ SEG backlit fabric wall, is one of the few portable exhibit solutions that can easily be setup and dismantled by one user, making it the easiest custom modular LED light box display to manage available on the market. The creatively engineered Pilko black powder coated aluminum free-standing single-sided or double-sided SEG graphic display frame, simply packs down in 1-flatpack wheeled hard case that can be affordable shipped standard UPS or Fedex Ground, making Pliko the lightest and most minimalistic LED edge-lit backlit display stand in North America. 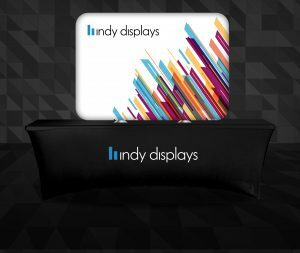 Indy Displays’ modern LED backlit display solutions create stunning SEG stretch fabric graphic mural illumination, without graphic hot-spotting or fabric panel wrinkling. The term “hot-spotting” refers to internal light shadows visible from the front side, which are created by poorly configured internal light box hardware or uneven light distribution. These issues are commonly seen on cheaper low-cost backlit display alternatives that include direct ink jet printing on the topside of thin fabric materials and improper light bar hanging or LED light strip placement. The Pilko ultra-portable LED edge-lit light box free-standing sign wall remains one of our top-performing backlit trade show display. However, the emergence of the hybrid SEG fabric backlit pop up display (released in late 2017) has quickly become our #1 low-cost alternative to the well-known brand-name Pliko light box display. Unlike Pilko, the Hybrid SEG backlit pop-updisplay promises an even more portable and user-friendly booth setup and dismantle. The new SEG backlit pop up display system is a hybrid spinoff system of the traditional Burst tension fabric backlit display, except with much better graphic attachment components, 100% wrinkle free SEG fabric panels and sustainability. This hybrid frames can be reused by exhibitors for years and can also reconfigure into large backlit display stands and different SEG light box booth wall structures. Up until 2017, our top-selling backlit trade show displays were the Pliko ultra-portable LED edge-lit light box display and the traditional Burst fabric backlit pop up displays. 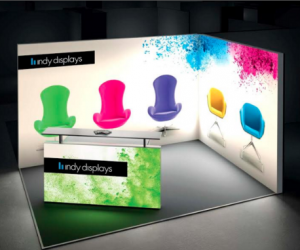 However, this year the Indy Displays innovative team added the new hybrid SEG backlit pop up display product line. Unlike our long time best-selling Burst backlit pop up display system, the new NEXT! SEG hybrid backlit pop up display and our next generation LED illuminated SEG modular pop up system offer simple user-friendly setup similar to the Burst display, plus an all new hybrid light box frame configuration! Now enjoy light box brand and logo illumination with your portable backlit pop up system without the worries of possible fabric graphic wrinkling (common fabric display issue that occurs after the user doesn’t properly repackage the display kit). combine the seamless wrinkle resistant SEG finishing technology with a unique pop up display that offers an all new and ‘next generation’ portable LED light box exhibit booth solution. Also, apart from the wrinkle-resistant fabric sign graphic panels, the SEG pop up systems also come in modular booth resize options that were up until this point only available for aluminumdisplay hardware. Now, you can easily increase the size of your pop-up stand from 8’ x 10’ light wallto a bigger 8’ x 20’ portable SEG light box booth wall by easily adding an extra pop up frame, SEG graphic bars and extra light bars. 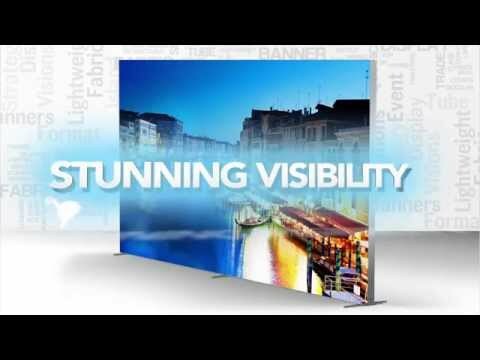 has quickly become a popular backlit signage system for innovative exhibiting teams and commercial interior designers. This Graphic Cube features a lightweight modular aluminum frame, SEG fabric graphic panels and internal LED lighting on all sides. The 3D backlit graphic structure may also be used as floor standing cubes – commonly used as a 3-unit floor stack display – and can be suspended from a convenient ceiling height and used as a hanging light box sign. This modern state-of-the-art illuminating graphic structure is available in standard frames and can easily be customized to meet any display booth fabrication requests. Also, the Backlit LED graphic cube setup and breakdown is user-friendly and very similar to standard custom modular light box display kits. Printed graphics are brilliant and rich thanks to the latest HD dye sublimation output technology that reveals a rich saturated color when illuminated. Each SEG fabric panel is stretched using a silicone edged strip attachment that makes for a wrinkle-free and stunning 3D illuminated signage structure. When you have a trade show display, you need to make every square inch count, because you don’t get that many of them. Ten feet by ten feet, that’s all you get. Possibly twenty by twenty feet, if your company is willing to shell out the big booth space rental bucks. In a sea of trade show displays, it can be a struggle to stand out and get noticed by prospects, especially when your brand is only visible inside a limited floor space. If business professionals want to really stand out, they can’t simply adjust one or two things here and there, they need to reframe how they approach common problems. So, what if, instead of a mere hundred square feet, you had access to the whole showroom? That is exactly the kind of capability drones provide you at a trade show. When the ground is full, look to the air. Trade Show Drones provide a unique way of overcoming space limitations, as well as shattering the old way of doing things. Drones are unmanned arial gadgets that capture real-time views of conference meeting and convention hall space. Drone technology provide professionals with a new dynamic in treading the trade show waves. Drones provide unparalleled digital advertising opportunities, innovative access to customer data, and that special “wow” factor tech marketers are always chasing. 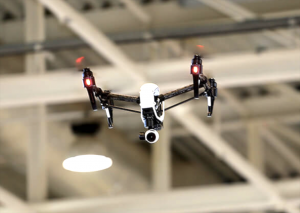 Event drones can also help with exhibition hall logistical issues. How many times have you dealt with show services (union labor or show decorator) misplacing, losing or delaying your display booth delivery? Convention halls get extremely messy during show move-in dates. Aerial drones can be used to locate packages and trade show crates by searching aisles and storage areas. The uses for trade show drones at exhibitions, conferences and outdoor events are limited only by the the pilot’s imagination. The most straightforward use is creating a moving billboard advertisement. Instead of stationary free-standing signage at the booth, exhibitors are using pairs of drones to fly billboards through the convention hall, taking the advertising to their customers. Since humans are normally drawn to movement, and drones are new enough to still be a novelty, this is a great way to grab eyes. While there are prototypes for digital billboards retailing for upwards of $20,000, drones can modernize traditional printed banners for a much more reasonable cost. Exhibition drones also provide marketers an exciting new way of garnering consumer and prospect data. Drones are already being put to use by municipal authorities for crowd monitoring and control, and marketers should take notice. Gone are the days of roaming the convention hall floor guesstimating the size of competitor crowds and intuiting what is working and what isn’t. In mere seconds, a drone can provide a real time, bird’s-eye view of a trade show audience. This innovative technology enables marketer to see exactly where the crowd is drawn and how long they linger within a particular location. Drone software provides an exceptional way to capture and analyze data about the quality of specific exhibiting campaign tactics. Using data analysis software tools, companies can turn previously qualitative, intuitive insights gleaned at trade shows into quantitative data and integrate it into their overall marketing strategy. Perhaps the most humanistic benefit to using drones as advertising tools is the fun factor they provide. Trade show drones are a unique novelty and really quite amusing. Marketers that invest in this technology now will get the infamous “early-mover” bonus. One does not have to be a marketing guru or “growth hacker” to imagine show displays making use of the interactive nature of drones. 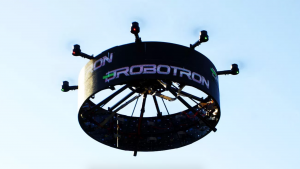 Whether it is as simple as hovering it a few inches off the ground, or as monumental as virtually allowing participants to soar through the host city while standing within a ten by ten foot booth space, drones foster attendee engagement. All of this interaction and attention, influences more visitors to engage with sales representatives. 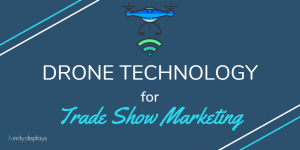 There has never been a better time to bring trade show drones and other exhibition booth technology into your overall marketing plan. If properly integrated, trade shows are a great way to show customers, employees, and stakeholders how much energy and goodwill your company offers. When an innovative company makes strides to rise above the competition, it can create a valuable positive impression. Drone technology isn’t the end-all-be-all but with the right people and strategy in place, drones can take advertising campaigns to the next level. One of the best ways to create a positive and memorable experience for attendees at your corporate events is to serve free freshly brewed quality coffee. In addition to giving attendees a welcome boost of energy in a mug, by properly brewing and serving the highest quality coffee, your guests feel value that creates a positive association with your event. Below are 10 reasons why you should forego the standard convention center snack fare and make free, Starbucks level premium coffee options part of your corporate catering plan. What better way to ensure an alert audience than a dose of morning caffeine? A five-star cup of coffee is something participants can enjoy, that will also help event attendees stay alert and energized on your agenda. Tracking down refreshments in a massive exhibit hall can be a daunting task for weary conference attendees that have been on their feet for hours. Save event participants time and energy by hiring an external local vendor who uses a mobile cart to serve coffee to guests. Promote your vendor’s location with floor stand signs and announcements to make everyone aware of the free barista location! There is a big difference between basic convention hall self-serve stations and a made-to-order cup of tasty transcendent coffee from a locally brewed supplier. Make your guests feel valued by hiring an experienced barista to serve your guests as if they were at your city’s top local coffeehouse. Creating ways to enhance your guest experience will help solidify a positive vibe association with your event, conference or trade show. When serving the standard “prison coffee” commonly provided for free by convention halls and most conference centers, you are often at the mercy of their staff’s service schedule, and may not be able to provide coffee at all times. By hiring an external coffee vendor, you can dictate when and where all coffee is served. Seasoned coffee drinkers are familiar with enduring the low-grade coffee typically stocked by exhibit halls and convention centers. Not only will they be pleasantly surprised, but they will appreciate your efforts to accommodate their preferences. A key benefit of enlisting the service of an external premium quality coffee vendor is the ability to use customized cups and promotional mugs to advertise your brand. In most cases, you can simply send a high-resolution copy of your logo to your preferred catering vendor, and they’ll manage the digital screen printing process. 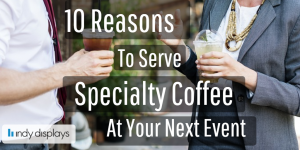 When you serve premium select coffee, your event will be remembered and reflected on by your guests, unlike typical corporate events that provide nothing of value to their guests year after year. Simple event planning innovations like professional top-shelf quality coffee services and other hospitality improvements, will create more positive experience’s for your guests and higher guest retention rates. Showing guests that your event hospitality team goes the extra mile, means attendees are likely to leave with a favorable opinion of your event. In contrast to standard options provided by exhibit halls and other corporate venues, mobile coffee baristas often also include hot chocolate and a handful of healthy tea options, in addition to their five star coffee selection. This is a welcome change for non-coffee drinking attendees who long for a fresh, hot beverage. The dairy (or non-dairy) selection that is served to accompany coffee is a critical part of the refreshment experience. By seeking the services of a professional local coffee vendor, you can typically choose from a wide variety of coffee additions, such as skim milk, half-and-half or soy milk. The absence of any hidden costs is a key advantage of enlisting the services of an external coffee vendor. Top-notch external coffee vendors do not charge additional fees for extras, like flavored syrups or double shots, and offer an all-inclusive type of service. Clearly, there are many reasons to bypass the low-quality exhibit hall fare in favor of premium coffee options. If you are an individual exhibitor and show coordinators are not offering better coffee, the above benefits still apply to show-site trade show marketing. Serving quality coffee will boost traffic to your own 10×10 trade show booth! Whether you are searching for a way to keep attendees focused on your presentation or simply want to create a positive experience for your guests to remember, utilizing great coffee is a superb solution. The marketing value of exhibiting at trade shows relies heavily exhibit booth attendance. Event marketing teams can still rely on design trends like brand illumination using backlit displays, effective promotional items, and proper pre-show email marketing campaigns to increase exhibition hall traffic. However, implementing these 4 new strategies before your next show could pay off by dramatically increasing foot traffic to your company’s exhibitor booth! UberEvents allows event organizers and exhibitors to purchase prepaid rides for show attendees. Incentivize your clients and interested prospects that are making an effort to visit your trade show booth space by helping them save on transportation. UberEvents makes it easy to create reserved rides for event guests by generating a free ride code. Exhibitors can set-up one code for all selected guests, or individual ride codes that are specific to individual exhibition attendees. The codes can be programmed to only allow free transportation to and from the event or trade show. Providing your visiting clients and attendee prospects with free scheduled transportation, is a unique and modern event marketing strategy available to exhibiting companies. Prepaid scheduled transportation will help increase exhibit booth attendance, as well as improve your client’s overall show experience and brand loyalty. Virtual reality is constantly improving, and the technology is new enough to draw a crowd of curious trade show guests. However, it offers more than just entertainment value. VR can save a company thousands of dollars on prototype production, instead programming their VR headsets to allow consumers to experience new products virtually. Virtual reality gives event marketers an opportunity never before available; the ability to take booth attendees out of the convention hall and transport them into another location. The possibilities are, quite literally, endless. Trade show guests can examine the handiwork of homebuilders, see a medical device at work inside a human body, or travel to exotic vacation destinations, all within a company’s trade show space. With so many innovative trade show products on the market, 2018 is the year to think outside the box for exhibit booth design. Trade show furniture of the past was either heavy and expensive, or cheaply built and uncomfortable. But now, exhibitors have the option of foam furniture with printable zip covers that are easy to transport and set-up! Design a comfortable lounge area that show visitors will want to hang out in, with couches and phone-charging coffee tables. A set-up like that is more inviting than the standard display backdrop and counter combo. Add unexpected small details, like plants or table lamps, to make your trade show booth memorable. Give your show guests a good reason to stay, and your exhibit booth attendance will naturally increase. In addition, exhibitors that take the time to create an inviting trade show display that features and “escape” layout, will motivate their guests to learn and retain more information about that exhibitor’s products and services. Leading up to your trade show, begin interacting with your company’s social media followers on Twitter, Facebook, Instagram, etc. Many marketing teams make the mistake of only posting self-serving content. They should also be responding to and communicating with real consumers. Introduce a unique hashtag specific to your event for attendees. They can easily follow updates and conversations about what to expect from your exhibition booth from the hashtag. If used the right way, social media can be an inexpensive way to stir up interest for your next event. The more approachable a company’s brand online, the more approachable their booth staff! You can also encourage attendees to post about the event before, during, and after the trade show by introducing a social media contest or giveaway. It’s important for trade show marketing teams to continually revamp their tactics, keeping existing and potential clients both interested, and invested, in their brand. What new concepts will you be integrating into your exhibit booth layout plans this year? Exhibitions are an excellent way to promote a company’s brand and services. A display’s graphic design will be the first branded item trade show guests see while walking the convention hall floor. When planning for a trade show, marketing teams must place a priority on instantly drawing attention on the show floor and building interest around their brands. 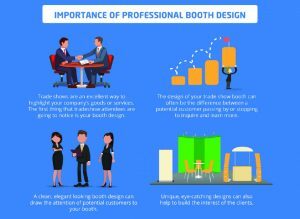 A well-designed booth should be simplistic and clean, but also unique and creative. Talented graphic designers understand that less is good. 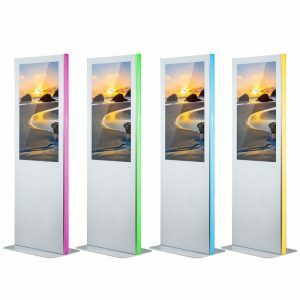 Trade show signage walls resemble free-standing billboard stands. Like traditional billboard marketing campaigns, brand marketers should create booth design layouts that tell a story without words. Your booth must boldly display your company name and brand. Customers cannot walk away from your booth not knowing who you are and what goods and services you provide. Know your audience and develop a campaign to grab their attention with eye-catching pictures and video to engage them. Don’t rely solely on face-to-face interaction for educating visitors, since not all visitors will have an opportunity to speak with sales staff. The products need to be prominently featured and visitors should be able to find answers to their questions easily. Firthermore, the design of a trade show booth should make it clear why a company has chosen to advertise to a specific audience. Whether it is to launch a new product or cultivate new clients, visitors appreciate a transparent and pleasant experience with show staff. Most of all, promotional products that are popular with the expo audience can help increase repeat orders from your customers up to 16%. While most people think of promotional trade show giveaway items as pens, water bottles, and key chains, they can be a wide variety of unique items. A few suggestions from the Indy Displays team are virtual reality glasses, sunglasses, luggage totes, antibacterial travel packs, LED keychain lights, bottle openers, smartphone cases and well-fitting quality shirts. Customers that receive creative useful giveaway products as personal gifts are much more likely to refer others to your company, compared to those who don’t have a tangible reminder. Brand imagery affects consumer opinion. Therefore, it is one thing that should never be left to chance in planning. Most of all, make your display booth graphic murals stand out. The display booth layout and visual branding will reflect upon your business and exhibitor staff. 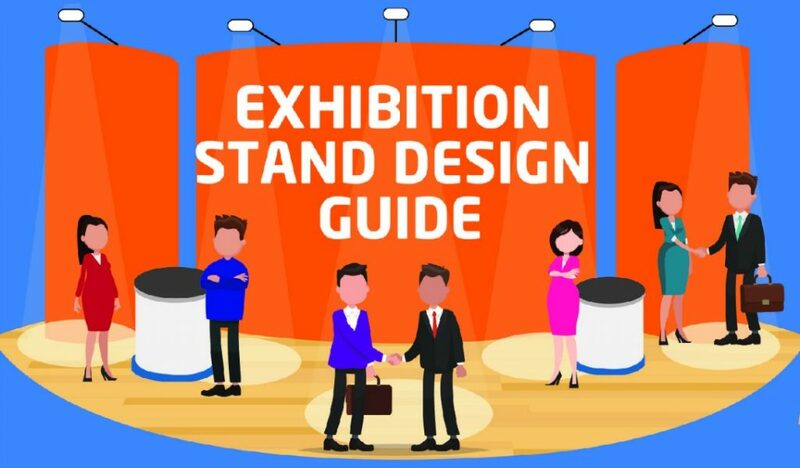 Therefore, an exhibit staff with a sloppy appearance and dated exhibition stand design will make your company look less desirable to prospective leads. 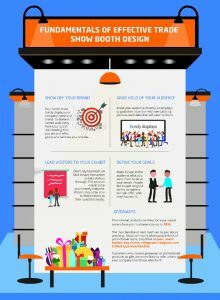 According to the famous 3-second rule, your booth design needs to engage and attract passers-by traffic in under 3 seconds. Otherwise, they’ll quickly turn their attention to another company highlighting their brand properly and staffing the booth space with knowledgeable marketers. Make sure the design theme and booth structure properly represents industry, brand, and company mission. Know your target consumer demographics and develop a promotional campaign that caters to them and creates organic interaction. The convention floor location of a trade show display is important, no matter what size the event venue. In addition, your company must refrain from employing an incompetent event team. It’s important to book early and secure an available premium space. Because spaces with high foot traffic go quickly, timing is of the essence, regardless of common excuses made for last minute decision making. Consider LED modular edge-lit light box display solutions to turn your booth design into an eco-friendly backlit trade show wall that requires far less electrical power. Custom modular displays are also reusable / resizable hardware systems, as a result offering companies versatility and unique ways to save on high shipping and drayage fees. Exhibitors looking to purchase a completely eco-friendly “green” exhibit solution, have the option to select recycled fabric and trade show LED lights that produce optimal HD quality printed images and colors illuminated by next generation light technology with up to 50,000 hours of shelf life! The advantages of occupying an island booth open space are worth the additional investment. Island exhibit floor spaces are located in the middle of the convention hall floor, making island booth rental locations the busiest areas on the exhibit floor for guest attendee foot traffic. As a result, island exhibit structures provide visibility and booth access from all 4 isle facing sides. Unlike standard inline exhibit spaces, open island center floor rental spaces typically do not have height trade show display stand height restrictions. Therefore, this allows exhibitors the opportunity to utilize additional graphic branding space unavailable to their inline exhibiting competitors. Gamification: The excitement of games and contests create memorable group experiences. The entertainment can be competitive, like industry related trivia or video games. However, they can also be passive, such as a traditional prize wheel. Interactive Storytellers: 3-D storytelling applications on free-standing monitor kiosks or handheld tablets allow companies to create customized buyer journeys and branding assets. Virtual Reality: Augmented reality delivers endless education possibilities, as companies can deliver experiences to visitors that they would otherwise never have the chance to experience in a trade show setting. Apps: Smartphone applications take advantage of the fact that every single trade show attendee has the technology in their pocket. In addition, apps can be used to track visitor behavior, gather contact information, or compile social media attention. 3-D Printing: Custom concepts can become a reality quickly and inexpensively with 3-D printing machinery. It’s that time of year when exhibit marketing teams are starting to plan and budget for 2018. Whether this means a complete overhaul of display inventory or updating elements, event teams should consider eye-catching innovative products that will grab attendees’ attention. 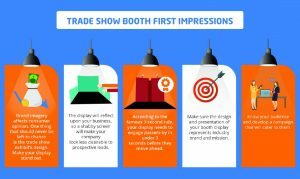 Below are some of the best ways that companies can update their trade show booth in 2018! Digital signage offers companies the ability to create an interactive experience at trade shows. Not only will brand messaging come to life, but digital signage allows customization, such as touch screen displays, video capabilities and the ability to utilize QR codes. These capabilities provide an opportunity for marketing teams to seamlessly integrate data collection into a trade show booth design. The information gathered from attendees helps to better qualify warm leads for post-show follow-up. Companies can include videos showcasing how new products or prototypes work, making it easier for the audience to conceptualize innovations. Digital signage can also be utilized for in-office sales presentations between trade shows. 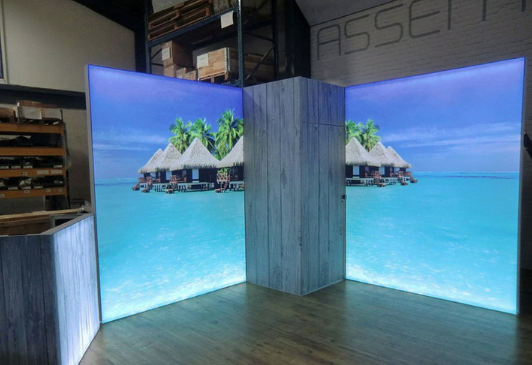 Backlit displays and LED light accessories are proving to be a continuing exhibit design trend. LED illuminated portable displays provide a bright and inviting experience for attendees, compared to dark, drab non-backlit displays. Backlit accessories, such as light box counters and center towers, pair perfectly with backlit trade show displays for a cohesive exhibit style. With the correct usage of light, a company can illuminate certain aspects of their sign structure that will attract their target audiences. Not only does backlighting take display graphics to the next level, it also makes the brand’s imagery brighter and more recognizable. An excellent way of utilizing backlit displays is to highlight high resolution creative campaign images on a large scale. Large LED backlit sign walls create brand visibility from afar, attracting attention from every angle on the exhibition floor. Charging stations are strategic trade show accessories that will attract traffic, while also keeping potential clients at a booth space for an extended period of time. They offer the audience a service that is in high demand at trade shows. While attendees wait for their phones to charge, the sales staff has the opportunity to engage in meaningful selling conversations. A short attention span is common at trade shows. Therefore, charging stations are paramount to retaining the interest of booth visitors. This provides a mutually beneficial relationship for both the company and the audience. Advertising event charging capability for iPhone users would perform well for a company that specializes in iPhone compatible technology and apps. A great way to create a real-life experience for the audience is to implement lounge furniture and attractive expo flooring into a trade show booth. If space allows, this can turn selling a product into creating relationships with customers that impact buying decisions. Creating a fun and welcoming environment for attendees also allows them to escape the madness of a trade show. Spaces can be created to align with the company’s brand and mood. For example, a start-up technology company could create a mood of inspiration and innovation by including modern furniture in a clean and open space. In contrast, a company specializing in outdoor technology equipment would provide a space that is warm and inviting by including wooden furniture and darker colors. Interactive technology can be extremely helpful in a trade show setting. Not only can it keep the audience occupied if the staff is busy, but it also helps facilitate traffic flow to avoid a chance of awkwardness. Virtual reality is one great way of utilizing cutting-edge technology. Virtual reality, whether presented as games or product demos, can virtually demonstrate a company’s product and allow the audience to walk away with a memorable experience. Plus, they add a fun element to an exhibit booth that will delight the audience. By including a virtual reality headset or game, a company can increase their booth traffic and become a more memorable. While some of these trade show display ideas are trending in the industry, they will not be fleeting. In recent years, social media integration has been trending. But, it’s important to focus on the human aspect that trade shows and events offer. Social media fosters engagement with consumers when face-to-face communication isn’t possible, but exhibitions are the time to prioritize offline engagement. A good way to utilize social media is to create posts that drive the audience to your booth. For example, including location, photos, and even the possibility of awards for visiting your trade show space. These posts will entice the audience at the venue to come to the booth and check out the company. Trade shows are about creating an experience for the audience and getting exposure for the company. The audience should walk out of the trade show with a new vision and excitement for the companies they experienced. Whether the eye-catching element be a trendy SEG light box wall design, modern event booth furniture, or integrating trade show drone technology, these booth boosters for 2018 will attract the audience to the booth and create a successful trade show experience.